The first event card you play each round that matches the attached hero’s printed sphere gains secrecy 1. I seem to remember a ruling that multiple instances of keywords with numerical values would stack. For instance if two of these were out they would have secrecey 2. I can't seem to find that rule anymore. Anyone know? I haven't found the ruling, but I did find something to confirm that Secrecy does stack. 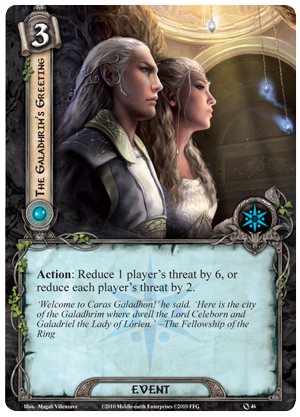 In the preview article for The Three Trials, they say "Moreover, because the effects of Secrecy stack, you could play a Leaf Brooch on three different Spirit heroes to play The Galadhrim’s Greeting (Core Set, 46) for free..."
That might be where I saw it before. Thanks for digging it up! I have a question about this card. Does leaf brooch works with neutral events like white council? Unfortunately not. There is no sphere match to make.